In The Eyes Of The Beholder: Happy Thanksgiving Day for 2013! Happy Thanksgiving Day for 2013! While others are busy preparing for the holiday season, we (members of Iglesia Ni Cristo) are busy preparing for our Annual Thanksgiving Day which we celebrate every third Sunday of December. It's the time of the year that we look back to all the goodness that we received from the Almighty Father. Trials and tribulations may have been experienced the past year but these made us all the more strong in our Faith. He has never left us and His love is unending. Words are definitely not enough to thank You, dear Lord! 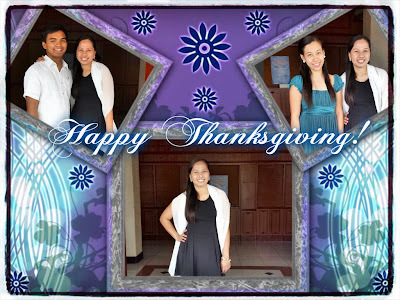 Happy Thanksgiving to all my brethren around the world!